I am honoured to serve as York University’s 8th President and Vice-Chancellor, and proud to present this first annual report of my tenure. A celebration of York’s bold vision, it links all that we have accomplished this year through the four pillars on which I am building my presidency and our University’s future: access, connectedness, excellence and impact. With each promising new student, new graduate, new program and new discovery, we take another giant step closer to realizing our incredible potential as individuals and as a progressive, engaged and connected university for the twenty-first century. With more than 300,000 alumni living and working around the globe, and campuses in Toronto, India, Costa Rica, and a new Markham Centre Campus opening its doors in 2021, a York education is taking our students everywhere. York is a comprehensive, community-engaged university providing a broad sociodemographic of students access to a high-quality, research-intensive learning experience committed to the social, cultural, economic, environmental and other well-being of the societies we serve. Our shared commitment to link access, connectedness, excellence and impact defines our community. 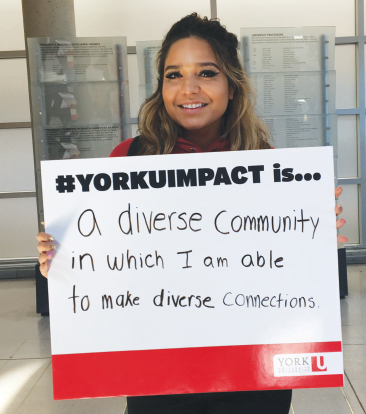 By offering our students diverse experiential learning opportunities in innovative learning environments, unique cross-disciplinary programming and community-engaged research opportunities, York University is fundamentally committed to equity and social justice and to bringing our scholarly, research and creative activities to bear in making the world a better place. Two-thirds of all jobs will require higher education, yet an enormous talent pool remains untapped because of barriers that prevent eligible students from attending university. York is unleashing that potential by increasing student aid and providing student-centred services and supports. 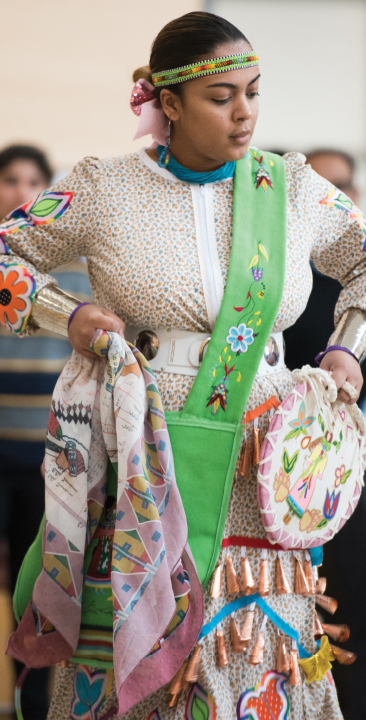 I am proud to be part of a post-secondary institution that is committed to the values of diversity, equity and inclusion and to making our campuses welcoming and supportive places for Indigenous community members. In 2017, fifty students from Dadaab, Kenya pursued studies for degrees from York so they can help to improve the quality of education and well-being in that country’s communities and refugee camps. Twenty-one Dadaab students are slated to graduate from York in 2018 with B.A. degrees in geography. 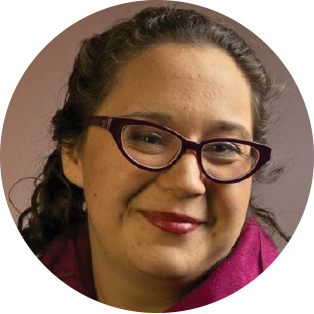 In 2017, York launched its Indigenous Framework, designed to advance Indigeneity at York and support more Indigenous students in realizing their education goals. The York Hart House was also renamed Skennen’kó:wa Gamig or the House of Great Peace. It is on the traditional territory of several Indigenous nations. 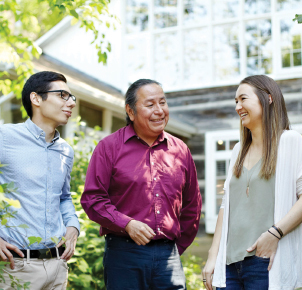 To further support and connect Indigenous students, a group of York students designed the Indigenous Friends App, which was awarded $210,000 from the Ontario Trillium Foundation in April 2018 to expand to other universities and colleges over the next three years. Osgoode Hall Law School also announced a new Indigenous and Aboriginal Law Requirement for JD students. Last September, York welcomed the 2017 Invictus Games to the Keele Campus, and announced a new award providing increased access to post-secondary education for Canada’s military personnel and their children. The York University Service Award provides up to $20,000 over four years to a York student who is a Canadian Armed Forces member, active or retired, and who has a physical, sensory, medical, mental health or learning disability. Between 200,000 and half-a-million young people are newly arrived immigrants to Canada hoping for a better life. Some experience uncertain immigration status during this journey which impacts how their dreams are realized. Building on its longstanding commitment to social justice, equity and inclusion, York partnered with FCJ Refugee Centre, Toronto’s oldest refugee agency, to allow 29 young “dreamers” with precarious status in Canada to study for a degree as domestic students. York is the first university in Canada to offer these young immigrants the chance to chase their dreams. We are continuing to harness the potential of our established strengths in interdisciplinary and transdisciplinary research and teaching, while creating new and innovative opportunities to prepare graduates for the global challenges of tomorrow. York’s dynamic pursuit of excellence includes a new campus-wide plan for innovation and entrepreneurship, engaging students in research opportunities with professors, and introducing experiential learning activities in every program. From Glendon’s entrepreneurial and innovation workshop series to Osgoode’s universal experiential praxicum, York offers a wide array of formal and informal hands-on learning programs and activities. In 2017-18, we continued to invest in innovative learning opportunities that set our graduates apart and prepare them for a rapidly changing workforce. York secured $2 million in new funding from the Ontario Career-Ready Fund to increase the number of Experiential Education Coordinators and to develop a network of partnerships within York Region. The goal is to support post-secondary capacity to increase both quantity and quality of experiential education opportunities available to undergraduate and graduate students both on and off campus. York’s Academic Innovation Fund (AIF) provided $1,687,100 in financial support to 52 projects focused on innovation in eLearning, Experiential Education and the Student Experience in 2017-18. 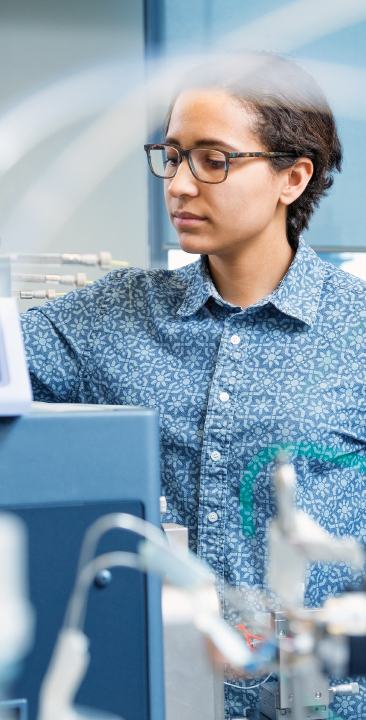 York is at the centre of several new, large-scale collaborative initiatives that are breaking down boundaries between the disciplines and connecting the University to our partners locally, nationally and internationally. A total of $120 million, including $33.3 million from the Canada First Research Excellence Fund, is mobilizing York’s Vision: Science to Applications (VISTA) program to help people live healthier, safer and more productive lives. 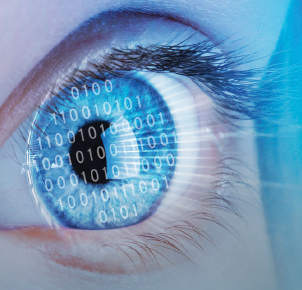 A partnership across five York faculties and more than 50 academic, not-for-profit and commercial partners around the world, VISTA builds on York’s strengths in biological and computational vision, and is currently ranked third in the world. The Government of Canada announced $8 million to help Ontario and Alberta homeless youth get the education, job skills and work experience they need. In partnership with the two provincial governments and dozens of community partners, York launched a Youth Homelessness Social Innovation Lab to oversee demonstration projects in 10 Canadian cities and develop the tools and resources to help other communities introduce similar projects. York is the academic lead for the microelectronic component of the federal government’s Advanced Manufacturing Supercluster, one of five Canadian superclusters slated to receive $950 million, with matching funds from the private sector. York joins more than 140 academic, government, not-for-profit and industry partners across York Region committed to helping advance the region’s manufacturing and technology sectors. Celebrating world-class rankings, research with impact, award-winning teachers, innovative students, inspiring staff and alumni making a difference. Schulich’s two-year MBA and Kellogg-Schulich Executive MBA programs were ranked #1 in Canada by Forbes and the Financial Times, respectively. 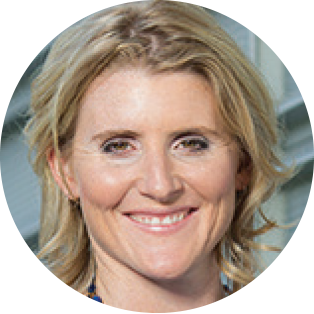 16 community and business leaders were recognized with honorary degrees in 2017, including former Governor General of Canada David Johnston and five-time Olympic ice hockey medalist Hayley Wickenheiser. 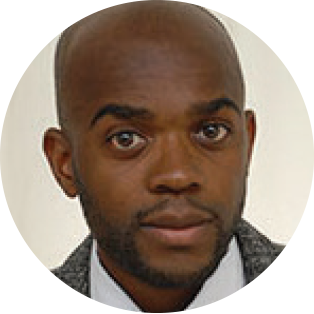 Doctoral candidates Tyrone Hall, Elan Marchinko, Kam Phung, Claudia Sicondolfo and Erica Tatham were presented with Vanier Canada Graduate Scholarships, the country’s most prestigious graduate awards. President’s University-Wide Teaching Award winners Bridget Cauthery, Minha R. Ha, Ruth Koleszar-Green, Dan Palermo and Reena Shadaan were hailed for their innovation and commitment to teaching. 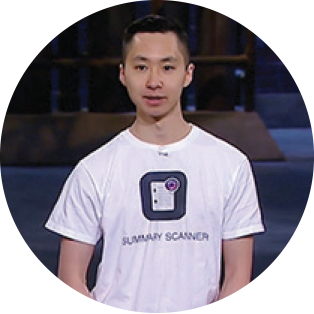 Financial and business economics student Kevin Chau made history as the first entrepreneur to make a deal with all six investors on CBC’s Dragons’ Den. York alumna and Internet personality Lilly Singh, BA ‘10, was named one of Time’s 2017 Next Generation Leaders for her efforts to empower young women. 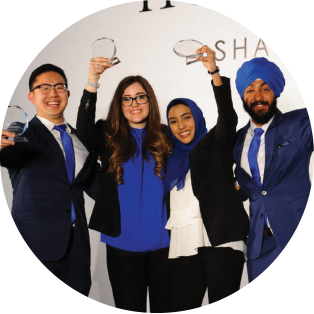 Empower, a team of Schulich student entrepreneurs finding ways to bring low-cost connectivity to refugee camps, was one of six finalists to compete for the prestigious Hult Prize. 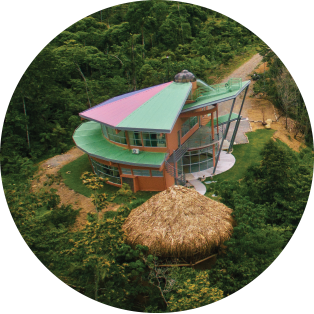 The Faculty of Environmental Studies launched its first full Semester Abroad program at York’s EcoCampus in Las Nubes Forest Reserve in Costa Rica, attracting 53 students from across six York Faculties. York is strengthening the connections between students and faculty, connecting students to their learning, and connecting our University to the people and places we serve and who can help us reach our full potential as a borderless community of learning and social justice. In a world where it is increasingly important to be connected — to our values, our communities and the world around us — York is working hard to build Canada’s most engaged university. 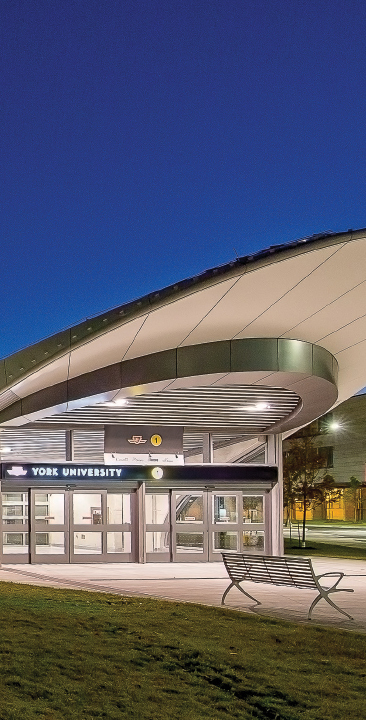 An exciting new chapter in the York University story began in December 2017 with the long-awaited opening of two new Toronto Transit Commission subway stations on the Keele Campus. Decades in the making, the multi-billion-dollar project represents the first subway to cross the city of Toronto boundary into York Region and the first extension to be completed in 15 years. York’s Keele and Glendon Campuses were a sea of red in March when the Indigenous Students Association at Glendon unveiled the REDress Project. 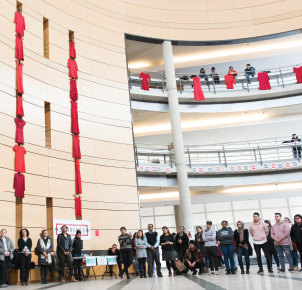 The month-long art installation featured 300 donated red dresses placed around campus to draw attention to the more than 100 unresolved cases of missing and murdered Indigenous women, girls and two-spirited persons in Canada. York’s Keele Campus is a growing community hub, drawing thousands of participants, volunteers, spectators and dignitaries for international sporting competitions, including hosting the track and field competitions for the North American Indigenous Games, and 2017 Invictus Games, as well as celestial events like the partial solar eclipse that attracted more than 2,000 people to the York Observatory in August. By opening York’s doors to all eligible students, broadening and deepening our ties to the communities we serve and improving the quality of our work, we are realizing a powerful impact — new buildings, programs and services made possible by our extended family of alumni, donors, partners and friends. A new, 21st-century campus is coming to the vibrant and growing Markham Centre, in collaboration with our partners, the City of Markham, The Regional Municipality of York and Seneca College. The campus will offer professionally-relevant academic programs and workplace-based learning opportunities to more than 4,000 students. 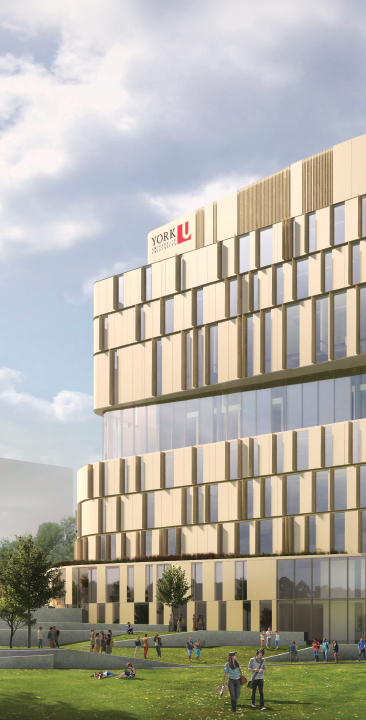 Opening in 2018, York’s four-storey, $72-million New Student Centre, built by students for students, will offer 126,000 square feet of meeting rooms, group study areas, recreational spaces, club offices, administrative support offices, commercial spaces and multi-faith prayer rooms. 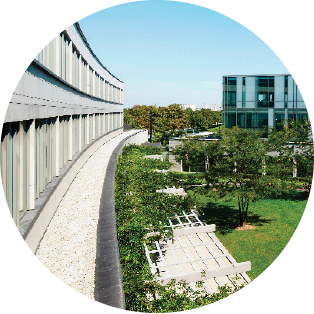 Opening in 2018 is the newest addition to the Schulich business complex. Named the Rob and Cheryl McEwen Graduate Study & Research Building, it is one of the most environmentally sustainable academic buildings in North America. In 2019, construction will begin on a $50-million School of Continuing Studies building to accommodate significant growth and support the creation of even more innovative programs for recent graduates, working professionals, international students and new Canadians. Our alumni and friends are the cornerstone of our Campaign successes as they provide tremendous support through generosity, connectedness and engagement. Their confidence in our University is the catalyst that drives our progress toward achieving our ambitions of undertaking globally relevant research, delivering unrivalled thought-provoking experiences and building stronger communities. We are proud to share that Impact: The Campaign for York University has raised a total of $400 million toward our ambitious $500-million fundraising goal. This funding has allowed us not only to realize our vast potential, but also to provide critical student financial support, establish transformative learning experiences, advance innovative faculty research and much more. The Campaign will dramatically increase financial support for our students to improve accessibility and enrich the learning experience. A $500,000 gift from the Carswell Family Foundation was matched by York for a total impact of $1 million to name the Allan Carswell Astronomical Observatory and install a one-metre telescope, the largest on a university campus in Canada. We are investing in the minds and the tools we need to play a growing role as a leader in research and academic programs. By recruiting and retaining top professors and researchers, we will continue to innovate and provide our students with the environment they need to expand their impact and open their minds. 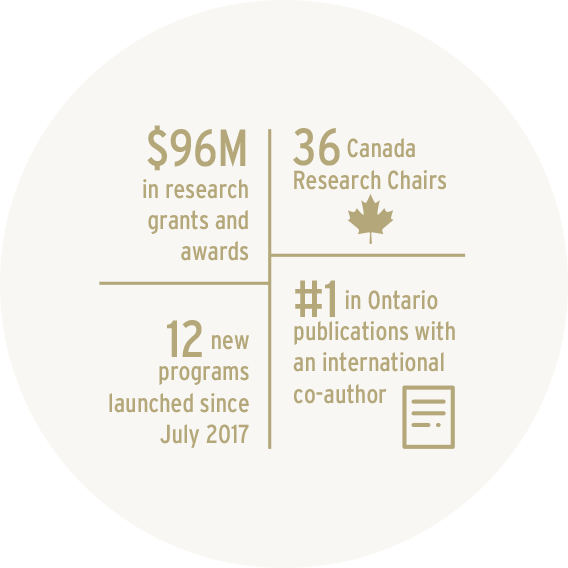 Sanofi Pasteur made a gift of $1.5 million, which NSERC matched by $1 million for a total impact of $2.5 million for the NSERC/Sanofi Industrial Research Chair in Vaccine Mathematics, Modelling and Manufacturing in the Faculty of Science. Our campuses are expanding and we are in an unprecedented period of growth and renewal of our infrastructure. We are committed to building our campus community and fostering our students’ commitment to focus on community building, locally and globally. 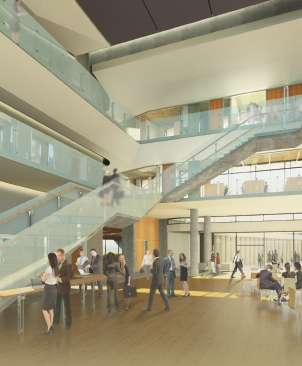 A gift of $8 million from alumnus Rob McEwen and his wife Cheryl supported the construction of the new Rob and Cheryl McEwen Graduate Study and Research Building at the Schulich School of Business.